"This cake is a huge hit with my family during the Thanksgiving and Christmas holidays. It's very moist and just melts in your mouth. It's a yummy alternative to traditional pumpkin pie. This cake is good as is, or sprinkled with powdered sugar. It is especially tasty with a good glaze drizzled on top. The glaze that my family likes best is made with cream cheese and a little bit of rum." Sift the self-rising flour and pumpkin pie spice together into a bowl. In another mixing bowl, beat the white and brown sugars, vegetable oil, melted butter, applesauce, vanilla, pumpkin, and eggs together until smooth. Gradually beat the flour mixture into the pumpkin mixture, 1/2 cup at a time, until completely smooth and well blended. Pour the batter into the prepared Bundt pan. Bake in preheated oven for 60 minutes. Cover cake with aluminum foil to prevent over-browning, and bake until a wooden skewer inserted into the cake comes out clean, 15 to 20 minutes longer. Cool the cake in the pan on a wire rack for about half an hour. 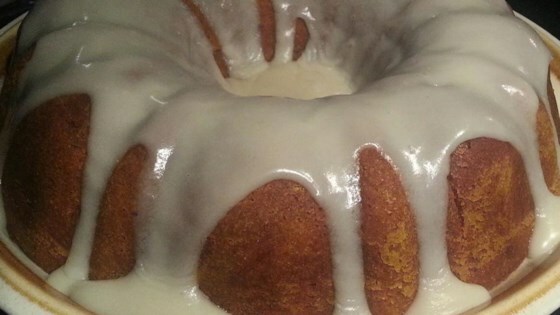 To unmold the cake, tap the bottom of the Bundt pan on the counter or work surface to help release it. Invert the cake on a serving plate and allow it to cool completely before glazing. To make the glaze, mix the cream cheese with the butter, confectioners' sugar, rum extract, and milk in a bowl. Heat in a microwave oven for 15 seconds. Drizzle spoonfuls over the cooled cake. Keep cake refrigerated after serving. Awesome cake, and actually Valerie there is a cookoing time- 1 hr. and all cooks should read the recipe before cooking. I made the Rum - Cream Cheese Glaze to pour over a spice cake. It was wonderful and very easy to make. Thank you! I will try it with the pumpkin cake next time. Just wanted to say the glaze was great.